The KTM 690 SMC R raises the bar for street hooligans. 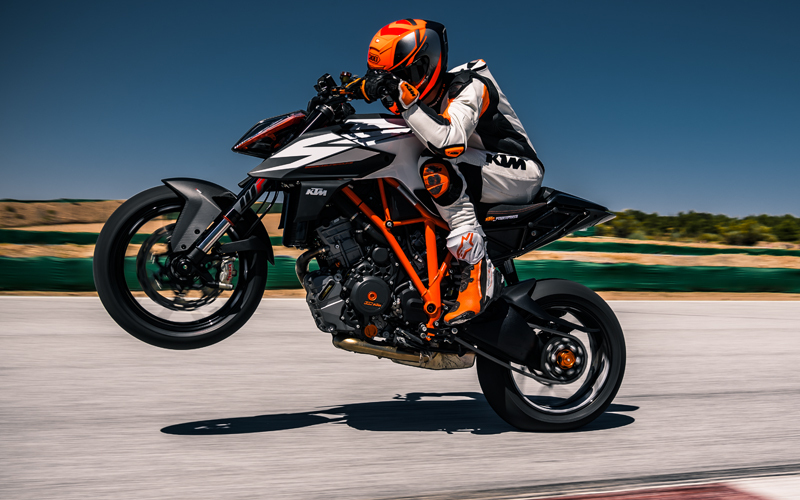 The revised chassis and styling are boosted by the latest 690 LC4 motor and an updated electronics package, so whether you express your tarmac-sliding talent on mountain roads or on the track, you'll be drifting into the future with a maxed-out grin and your veins coursing with adrenaline. Handling is enhanced by the latest fully-adjustable WP APEX suspension, so all you have to worry about is focusing on the road ahead and twisting the throttle to the stoppers. When you look at the all-new 690 SMC R you know its READY TO RACE. Pure, extreme, oozing performace, its style is inspired by KTM's race-winning genes. The KTM 690 SMC R has some serious attitude and you can adapt it to suit your personal style with the KTM PowerParts range of accessories. Developed specifically for individual KTM models, all PowerParts perfectly complement the rider and provide that important 'factory fit' straight from the dealer.